Tristanians are famed for their craftwork, whether it is garments knitted from home-spun wool or model longboats. Many items are made specially to order. Tristanians are famed for their craftwork, whether it is garments knitted from home-spun wool or model longboats. Many items are made specially to order. Find out more about how Tristan woollens are produced, from sheep to garment, at our 37 Degrees South Knitwear page. Knitting has been an important part of island life on Tristan da Cunha for nearly 200 years. The island's knitwear is hand made from locally spun wool, and marketed worldwide under the trade name "37 Degrees South". The main products are sweaters ('ganseys'), hats, socks and stuffed toys. Tristan socks are knitted from plain wool, but topped with two or more stripes of brightly coloured wool. When women knitted socks for their sweethearts, the number and colours of the stripes indicated the depth of the affection they held for them. Now you can buy them for your own sweetheart. If you prefer, you can knit your own garments using Tristan yarn. The wool is sheared from island sheep, carded and hand spun into 'wosted'. 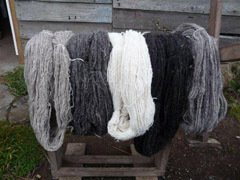 Our skeins are undyed and come in a range of natural colours from black to white, and shades inbetween. Our knitted rockhopper penguins are always a popular gift for children and grandchildren. Tristan da Cunha is famed for its longboats. Originally made from canvas over a wooden framework, our models are made of the same materials, and come with oars and sails. They are available in several sizes. 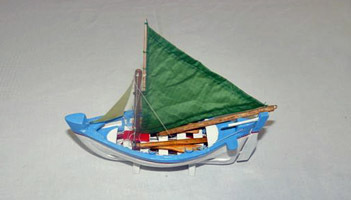 The white hulls are decorated with the coloured bands of individual real longboats, which rejoice in such names as 'Margaret Rose', 'Raffee', and 'British Flag'.